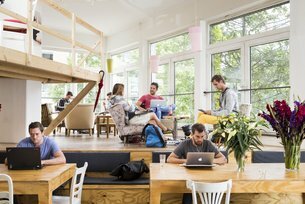 What we refer to as ‘hubs’, others might refer to as clusters, labs, co-working spaces or incubators. Any physical or virtual ‘place’ that creative people meet, connect and collaborate is what we mean by a ‘hub’. Whether that’s: a collective or co-operative; a creative, tech or cultural space; a network that gathers people or a space that houses a cross-disciplinary family of creatives. The creative industries has quickly become a community that thrives on structured serendipity and this new ecosystem is fast becoming one that we have to support and sustain. A membership of 1300+, Creative Edinburgh helps businesses and individuals create, collaborate and stay connected through an annual programme of opportunities. Creative Dundee connects creative talent with opportunities and has been amplifying the city’s creative pulse since 2008. TAKTAL is an agency that produces creative projects and connects people with spaces. They collaborate with artists, cultural organisations, property owners and national agencies, to initiate the creative use of space. CodeBase is the UK’s largest tech incubator. Based entirely on private equity and home to some of the best tech companies in the country. Their goal is to drive investment in to tech startups and improve digital skills for business. Lighthouse is a digital culture agency based in Brighton. They support, commission and exhibit work by artists and filmmakers, creating vibrant and inspirational programmes. Near Now is Broadway’s producing, commissioning and artist development programme, working closely with artists and designers to produce and present playful projects that explore technology in everyday life. Fabrica is an educational institutution, research workshop and studio based in Italy and working globally. Blick Studios provides workspace, business services and events to inspire, support and encourage digital and creative start ups within four different creative spaces in Belfast and Derry-Londonderry. Christine also manages Eighty81, a creative hub and former venue of Turner Prize 2013.